A seat on the U.S Federal Reserve Board, carries tremendous power. The seven members of the Board of Governors of the Federal Reserve System are nominated by the President and confirmed by the Senate. A full term is fourteen years. During that time, a board member can influence the financial policies of the world's most powerful economy. In some ways the seven men and women, have more power than Congress or even the President himself. That's why appointments to the Federal Reserve Board deserve as much scrutiny as those to the Supreme Court. President Barack Obama recently made three nominations to the Federal Reserve Board, Janet Yellen, Peter Diamond and Sarah Bloom Raskin. I think these are all great choices, and ones that will move Fed policy in the needed direction -- responsive to the needs of middle-class and working families. Of the three named, one stands out in particular- Sarah Bloom Raskin. That surname should ring alarm bells. That's because Sarah Bloom married into what is perhaps the closest America has to a radical "royal family". Sarah Bloom Raskin is the wife of Jamin (Jamie) Raskin, a legal academic, Maryland State Senator and the son of Marcus Raskin - founder of the deservedly notorious Institute for Policy Studies (IPS). In 1963 Marcus Raskin and his partner, the late Richard Barnet founded their radical "think tank" in Washington DC. IPS quickly grew to become a highly influential, source of ideas, guidance and training for the U.S. and international left. Its critics claimed that IPS consistently supported policies that aided the foreign policy goals of the Soviet Union and weakened the position of the United States. Since its founding, IPS has consistently followed a pro-socialist line on foreign policy, defense and the economy and has spawned a large number of spin-offs, other think tanks and public affairs organizations following the same radical agenda. In 1978, in an article in National Review, Brian Crozier , director of the London-based Institute for the Study of Conflict described IPS as the "perfect intellectual front for Soviet activities which would be resisted if they were to originate openly from the KGB". IPS became a place where leftist Congressmen, Senators and Capitol Hill staffers could mingle with third world radicals, East Bloc diplomats and even a few identified KGB agents. The FBI was intensely interested in Raskin's institute, until IPS sued the agency and extracted a written agreement forbidding any further FBI surveillance - an agreement, I believe, that still stands today. In the early 1990s IPS worked with Democratic Socialists of America and socialist Congressman Bernie Sanders to set up the now more than 80 strong Congressional Progressive Caucus. In 2003 IPS also helped set up the communist dominated "peace" umbrella organization, United for Peace and Justice. 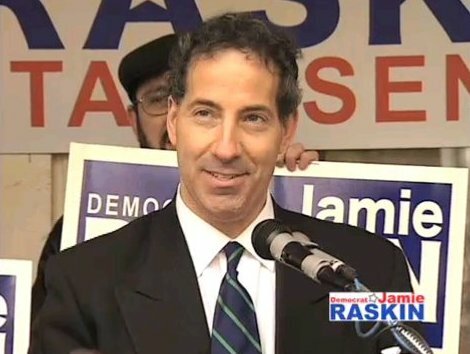 Jamie Raskin admits that he grew up "in an environment of progressive politics". An Harvard graduate and a "lifelong progressive Democrat", Jamie Raskin has brought "innovative ideas and a hands-on approach to government and politics at every level." He has served on the Montgomery County Hate Crimes Commission, the Takoma Park Election Redistricting Task Force, and the Takoma Park Gun Policy Task Force. In 1992, he served on President Clinton's Justice Department Transition Team for the Civil Rights Division. He was elected as a Kerry-Edwards Delegate to the Democratic National Convention in 2004. A member of the board of FairVote, the nation’s leading electoral-reform group, Raskin is best known as "a champion of voters’ rights". In his 2003 book, “Overruling Democracy: The Supreme Court versus The American People,” Raskin documented the Rehnquist Court majority’s "assault on voting rights" in the 2000 election, and "placed Bush v. Gore in the context of a series of Supreme Court decisions undermining the participatory rights of the people." Focusing on the Rehnquist majority’s statement that the “individual citizen has no federal constitutional right to vote” for president, Raskin argued for a constitutional amendment guaranteeing the right to vote (and to get one’s vote counted) to all Americans. Raskin has served as a Washington-area Board Member for the Rev. Jesse Jackson's heavily communist infiltrated National Rainbow Coalition. 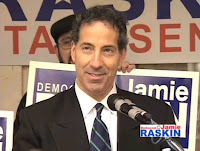 He has worked closely with far left Rep. Jesse Jackson, Jr. to advance a voting rights amendment in Congress, and with IPS affiliated Rep. Eleanor Holmes Norton to "advance a voting rights agenda for the people of Washington, D.C."
Unsurprisingly Jamie Raskin has done pro bono legal work for SEIU, ACORN, Greenpeace and the radical led Students Against Sweatshops. He has written for two Democratic Socialists of America and IPS affiliated journals, The Nation and In These Times. Raskin has also served on the board of Progressive Democrats of America, an IPS spinoff , which is effectively the activist wing of the Congressional Progressive Caucus. On March 10, 2006, IPS supporters, Yolande Fox and former Algerian Ambassador, Cherif Guellal hosted a book launch, in their Washington home, for Jamie Raskin's most recent book entitled "Overruling Democracy: The Supreme Court Versus the American People" at their home in Georgetown, Washington, D.C.
Fox was a former Miss America (1951) from Alabama. Cherif Guellal was a former top lieutenant to Algerian revolutionary leader Ahmed Ben Bella - winner of the 1964 Lenin Peace Prize. Guellal also had ties to the British Fabian Socialist Society in the early 1960s. During the 1967, Six-Day War, Algeria severed diplomatic relations to protest United States support for Israel. Instead of returning to Algeria, Guellal became a Fellow at IPS. Other attendees included Jamie's father and Marcus Raskin, , James L. Hudson and Ira Lowe. Jim Hudson, a long time Washington "insider' was recently appointed by President Obama to the Directorship of the European Bank for Reconstruction and Development. Ira Lowe is a trial lawyer and IPS supporter. He formerly represented IPS affiliate and Progressives for Obama founder Tom Hayden. Incidentally, IPS Trustee , Democratic Socialists of America member and Progressives for Obama co-founder Barbara Ehrenreich said of Raskin's book "This brilliantly argued and meticulously researched book both alarms and inspires"
Sarah Bloom has no known direct ties to the Institute for Policy Studies, but she did work for IPS connected Washington law firm Arnold & Porter from 1988 to 1993. A current Arnold & Porter partner , Jeremy Karpatkin, is a former Democratic Socialists of America youth organizer. In 1992, in Chicago Karpatkin directed field operations during the successful Senate run of far left Democratic Party operative Carol Moseley Braun. Coincidentally Barack Obama ran the Project Vote voter registration drive that year that helped Moseley Braun to win. In 2004 Obama took over the same Senate seat. Nearly three decades earlier, pioneering trial lawyer Charles Halpern became involved with IPS through Arnold & Porter. The firm handled IPS's legal work and partner Thurman Porter had been an IPS trustee. Halpern became corporate secretary to IPS, keeping minutes and records. he began to attend IPS seminars and parties at the Institute and at the home of founder Marcus Raskin, where he met radicals "like Paul Goodman and Ivan Ilich". When Raskin and several other activists were arrested for conspiring to obstruct the military draft, Halpern helped with the defense. Halpern flew with Raskin to a meeting with the other defendants and their lawyers at the Greenwich Village home of radical lawyer and secret Communist Party USA member Leonard Boudin - father of Weather Underground terrorist Kathie Boudin. Fellow terrorist Bill Ayers and Bernardine Dohrn would later raise Kathie Boudin's son Chesa Boudin after she was jailed for her terrorist crimes. 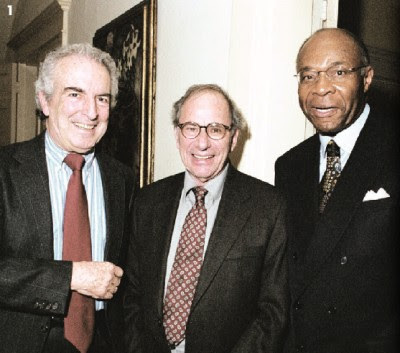 The radical Center for Law and Social Policy (CLASP) was founded in 1968 by Charles Halpern and three other lawyers, with the assistance of former Supreme Court Justice Arthur Goldberg, who chaired the CLASP board. A veteran of several communist fronts, Goldberg was, in the late 1940s, a Chicago law partner of Abner Mikva. A life long time associate of communists and socialists and an IPS affiliate, Mikva went on to employ a young law clerk named Elena Kagan and to mentor and befriend a young Chicago lawyer named Barack Obama. In 1999 Charles Halpern went on to found a New York based "think tank" Demos, an official partner organization of IPS. Among those recruited to set up and join the first board of Demos was a then obscure Illinois State senator named.......Barack Obama. Several years later a young San Francisco communist named Van Jones was also recruited to serve on the Demos Board. Strangely, Jones was suggested as a possible "Green Jobs Czar" for the Obama administration by Demos and IPS staffer Chuck Collins, in an article written several months before the 2008 Presidential elections. Robert Kuttner is a Distinguished Senior Fellow at Demos and serves on the board of the Economic Policy Institute with Larry Mishel. He is closely aligned to to Democratic Socialists of America, which has described Kuttner as a "socialist". Will Sarah Bloom Raskin sail into fourteen years at the helm of the U.S. economy, on a pleasant face and zero scrutiny? Or will Senate Republicans and the media do their job and ask some serious questions? You would find lots of lawyers when you begin to surf different websites. Klein on "The Manchurian President"